On 26 October 2014 the Montana community hosted an International Day to support the work of the SMA in Africa. They also took the opportunity to distribute some of the Apostolic Work materials, received through the SMA in Cork, to priests from poorer parishes in South Africa. The Montana community realised that they were more fortunate than other parishes. “Two of our pictures show the delight of the priests at getting this gesture of community sharing, through the good work of Apostolic Workers and their supporters in Ireland. I also gave the Bishop some of the vestments he had from Ireland as well as a Monstrance for some of his poorer parishes. Special guests on the day were young African priests from different congregations. We had Fr. Godwin Abbah, a Redemptorist from Nigeria. Fr. Godwin grew up in the SMA St Joseph’s, Gowon Estate in Lagos during the period when I was responsible for St Joseph’s. It was nice to see some of the fruits of my work of that period! Also there was Fr. 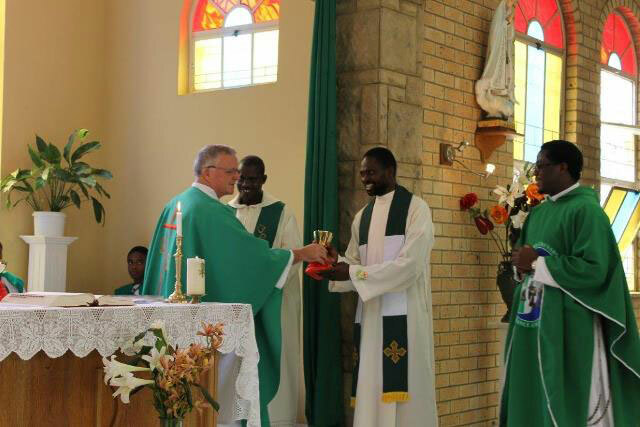 Joseph Ogunbde, an SMA priest from Nigeria working in the diocese Rustenburg. Also we had Fr. Joseph Mangon’go, a Consolata priest from Kenya who now works in Pretoria. It was a wonderful day where food items from Ireland, Switzerland, Italy, Portugal, the Caribbean, Mauritius, India, Angola, Malawi, Nigeria, DR Congo, Kenya, Lesotho and various South African dishes were there for tasting. The accompanying pictures show something of the challenge facing the Church in South Africa. To ackowledge their presence Fr. Michael presented each of the young priests with a chalice or ciborium that he had brought back from Ireland from the Apostolic Workers. They were intended for the parish of Montana but the occasion allowed the opportunity to demonstrate to the people the value of the work of these groups of dedicated lay people from Ireland who have supported the work of missionaries for years. They equip these young men with the essentials to undertake their work as priests in different parts of Africa. The church in South Africa must now follow their example and start raising funds to assist the various congregations who are now sending missionaries from various African countries to different countries in Africa. Montana has made a start as was evidenced by the support for the program. Well done to the members. We will provide a desk calendar for 2015 from the proceeds of the day and make it available in all the parishes where SMA priests work in South Africa. Also part of the proceeds will be forwarded to MSF to help in their work in Liberia, a country where SMA Fathers are working, in the fight against Ebola. Our second picture shows the visiting priests with a team of five male altar servers (our Altar girls were given a break for the day to make a point!!!!). We also had another team of five altar servers for our first Mass that day. 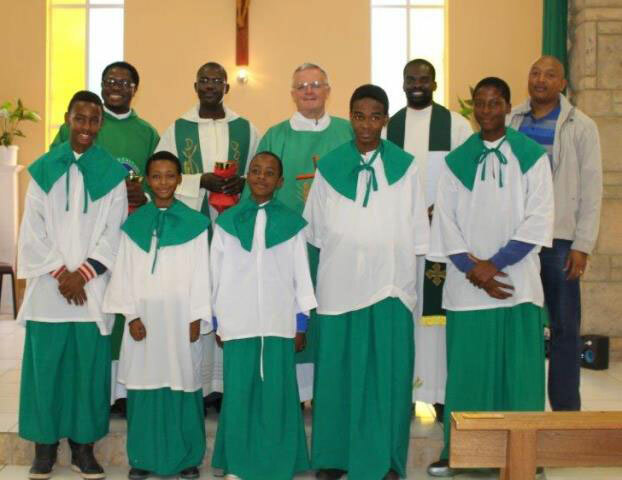 In South Africa we have a great reservoir of altar servers. What parish in Ireland today can boast of a team of five young boys willing to serve Mass on any Sunday? Each of the visiting young missionary priests had grown up as altar servers in their home parishes. Despite the number of altar servers we can draw upon in South Africa, we the SMA, having been in South Africa for 30 years are still waiting to get one young person knocking on our doors requesting admission to the SMA. 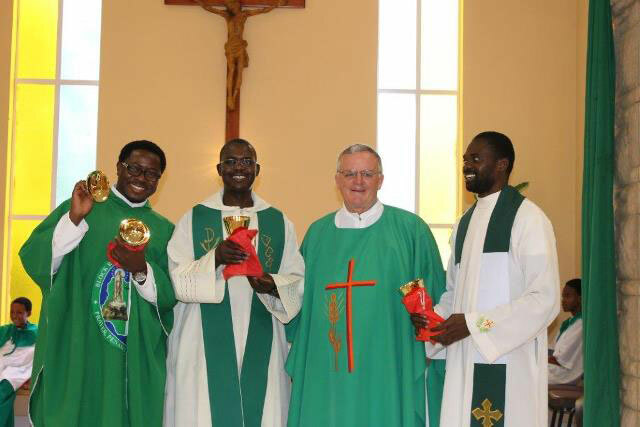 All the other countries where the SMA work in Africa can boast of young men, like these men in our picture, who are now ordained and working for the SMA. Why is it that the church in South Africa is so slow in providing men not just for the SMA, and also for the other congregations?